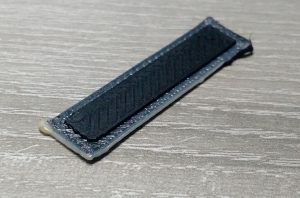 When ETPU 85-700+ Carbon Black or ETPU 95-250 Carbon Black is 3D printed together with an insulating flexible material like Ninjaflex, X60 or others, it can be used to fabricate very interesting electrical devices like Electromyography (s) EMG electrodes, Piezo resistive or Capacitive force sensors. 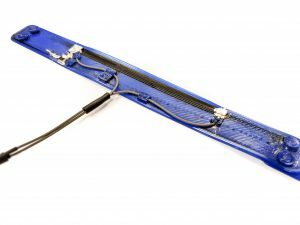 Below user cases regarding Electromyography EMG electrodes, Piezo resistive force sensors and Capacitive force sensors are written by: Gerjan Wolterink and Martijn Schouten. The different sensor developments are made by Gerjan Wolterink, Martijn Schouten, Remco Sanders, Gijs Krijnen, Frodo Muijzer, Bert-Jan van Beijnum and Eric Perez . 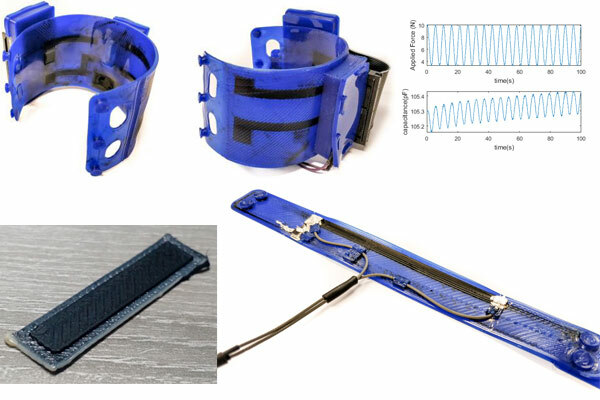 Text and Development of “Whisker Inspired 3D Multi-Material Printed Flexible Tactile Sensors” by Bram Eijking, Remco Sanders and Gijs Krijnen. All development cases on this page are from the University of Twente Enschede, The Netherlands. Some projects were made as demonstrators for the IEEE student measurement challange at the IEEE conference in Glasgow in 2017. Electromyography (EMG) is a technique in which the electrical activity of muscles is measured. The electrical signal can be measured by placing electrodes on the skins surface and connecting these to an amplifier. These electrodes have to be placed exactly on the location of the muscle. Therefore, at the moment often each electrode is placed manually. With 3D printing personalized sensing structures can be manufactured relatively cheap and fast. 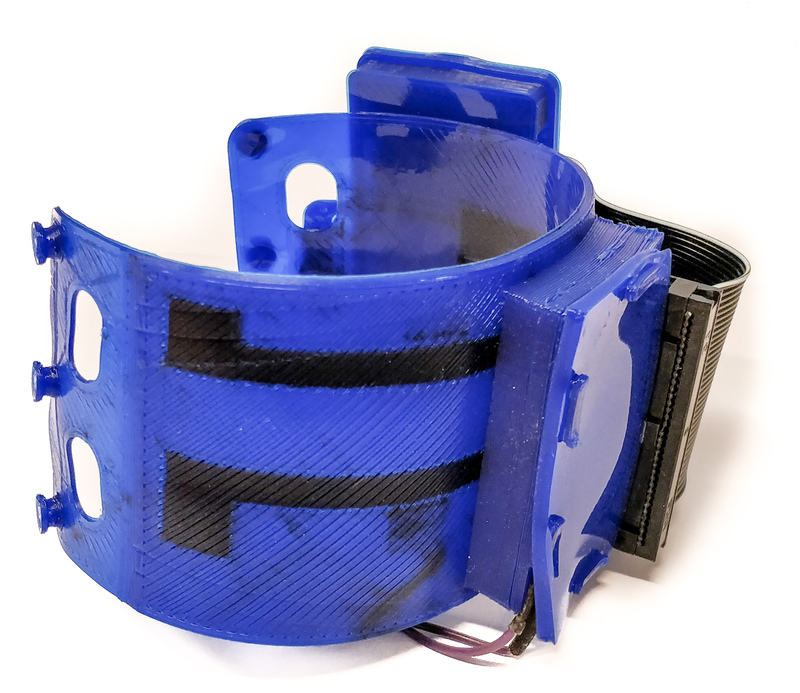 The figure below shows a 3D printed bracelet in which the electrodes and routing are made of PI-ETPU. The electrodes are positioned such that they are exactly at the right position for a specific subject. Since the resistance of a piece of PI-ETPU changes when it is deformed it can be used to detect forces. For example a line of material can be printed on a flexible bracelet and when the bracelet is stretched the resistance changes. If this bracelet is placed around the upper arm you can measure the contraction of the biceps. One of the most challenging things in the fabrication of these sensors is how to connect the PI-ETPU reliably to the readout electronics. With some practice it is possible to “solder” wires in the PI-ETPU, by using an old soldering iron that is set to a temperature of 230°C. 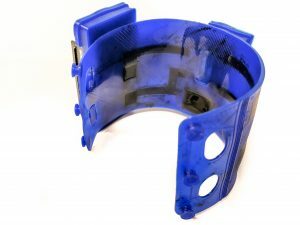 Also if the piece of material is thick enough, it is possible to make an electrical connection by just pressing a pin into the material. To get a really good connection silver glue can be used to glue a wire to the PI-ETPU. The movie below shows a demonstration of a bracelet that combines a resistive sensor and EMG electrodes. The resistive sensor measures the contraction of the biceps and the EMG electrodes are used to measure if the muscle that is responsible for wrist movement is active. The image on the screen is showing what the sensors are measuring. Since PI-ETPU is so flexible, when it is used to print a capacitor, this capacitor will be so flexible that it can be easily deformed. 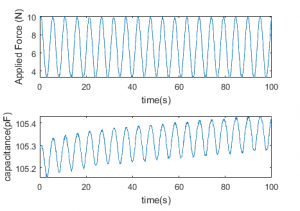 This deformation will cause a change in capacitance of the sensor. This capacitance can be measured using a capacitance to digital converter chip like the FDC1004. 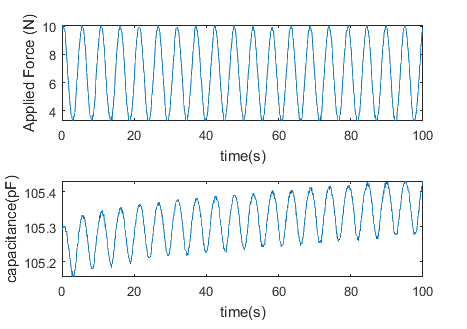 The figure shows the response to an electromagnetic actuator that is pressing on the sample. In the fabrication of these sensors two small tricks can be used. 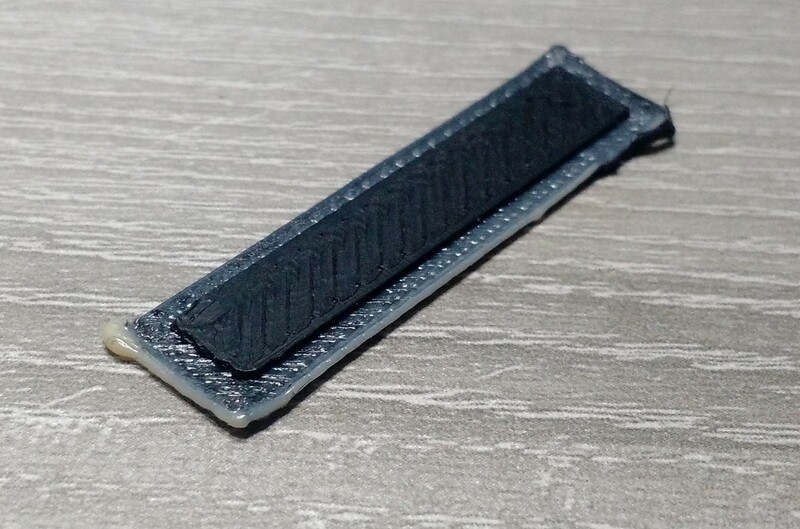 The first trick is to print the insulator with an infill slightly lower than 100%, this makes that it is even easier for the sensors to deform. The second trick is to place the sensors in an oven at 150°C for a couple of hours. This will significantly reduce the resistance of the electrodes. In this paper: http://ieeexplore.ieee.org/document/8233952/ a bio-inspired tactile whisker sensor made by 3D printing is discussed. Whisker inspired sensors were printed using flexible dielectric and conductive thermoplastic poly-urethane (TPU). The conductive TPU is used for strain-gauges facilitating resistive read-out. A single whisker sensor contains two strain-gauges allowing to determine both the force acting on the whisker as well as the contact point on the whisker. To the best of our knowledge this is the first work on 3D multimaterial printed, flexible, whisker inspired tactile sensors. Animals like seals and rodents make use of whiskers for sensing their surroundings. These tactile senses have been studied in detail and it is shown that this principle can be used in active sensing. Whiskers can be used for sensing in surroundings were other sensor techniques are not applicable such as in darkness and environments were noise has a big influence. Previous publications have shown the capabilities of using whiskers for applications such as contact imaging and three dimensional position measurements. Previous publications have also explored the possibilities of 3D printing whisker sensors, for this whisker one material was used and read-out was done using PCB-based capacitive sensing.